Summer Sunday School 2010 - Good Shepherd L.C. 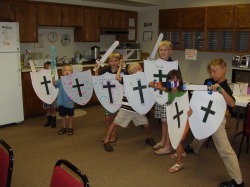 One of the summer themes was "The Armor of God". Other summer lessons included "The Wise and Foolish Builders" and "Built by God- the Amazing Human Body".